The dust hasn’t settled just yet, but we landed in Austin, Texas last month and we’re in between homes for just a few more weeks. But there’s been enough dust settling to allow for a little birding. 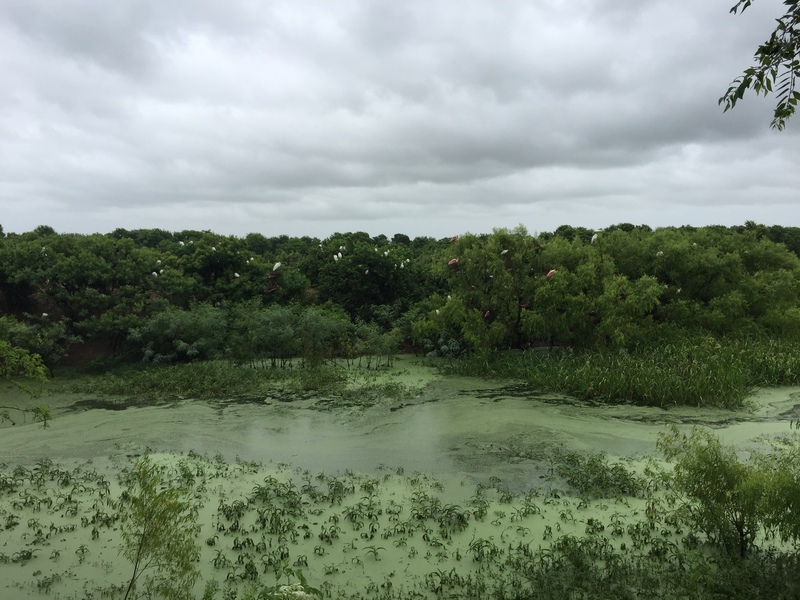 Memorial Weekend took us to Galveston and High Island where we scouted out areas for birds. Yes, we just missed the peak of Spring Migration, but we were able to get a few migrants, and the local “usual suspects” are often new to me. In fact, I’m still garnering a new lifer every couple of days here in Texas. Plus, we considered the weekend a bit of a reconnaissance mission to prepare for Spring Migration 2016. We now know where we want to stay and where to get some good barbecue brisket in Winnie, which by the way, cuts like butter. I swear, they’d been slowly cooking it since January. My favorite spot this weekend was the rookery at Smith Oaks Sanctuary at High Island. 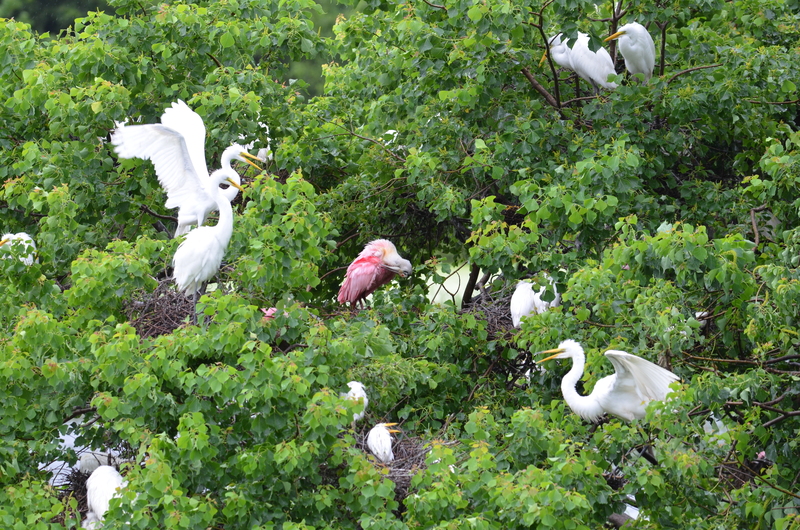 The trees were dripping with egrets and roseate spoonbills and though a soggy day, it meant very few birders were at the rookery. The photo above is a favorite because there’s a lot going on in the photo. Spoonbills on a nest, egret chicks in a nest below them, a pair of egrets that squabbled at anything that got near them, more chicks at the far left, almost out of frame, and a single egret at the right who displayed occasionally. And then below all of this was this guy lurking, waiting for someone to lose his footing and become lunch. I couldn’t watch what was about to happen. You hardly know where to look with all this going on. 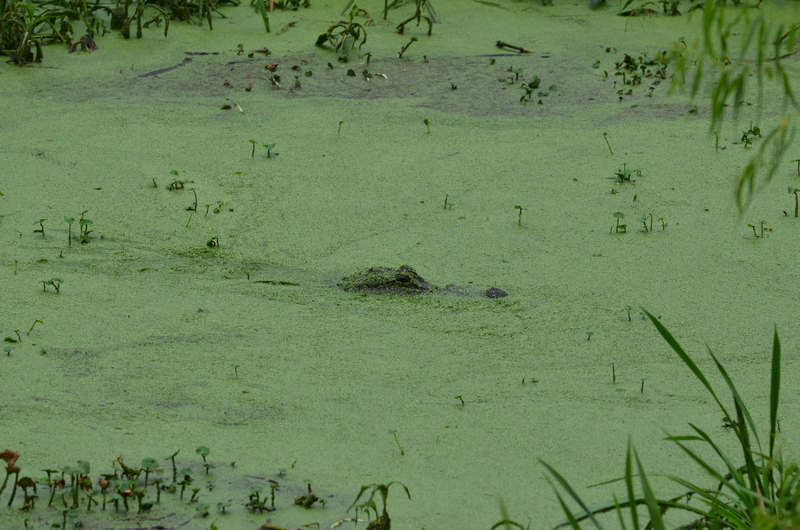 I’d be watching an adult egret feed its chicks and then a beautiful roseate spoonbill flies by and I can’t get my lens on it fast enough, and then I’d hear the ruckus—a BIG RUCKUS—in the water and figured the alligator got some little guy and I’m happy I missed it. I’ll post more in the next few days—there’s just too much to cover here in this post. But for now, know that even though Spring Migration has passed, there’s still a lot going on out there. Glad you enjoyed High Island and the rookery. I have been 3 times this year and plan one more to see the chicks. It is a fantastic place for photos. Thanks for dropping by, Linda. There were so many chicks at the rookery! I’ll be posting some more photos all about the chicks. I wish I lived closer to that rookery. I’d be there all the time. Wow, there certainly is a lot going on here! Nice job capturing the feeling of this place and how busy it is, even if it is after the height of migration. I loved that place and so glad that we went. A lot of birders think all the joy and excitement is past and gone once the migrants have left, but nesting season has begun and there’s lots to observe and enjoy. Plus we’re new here so everything is a surprise to us.